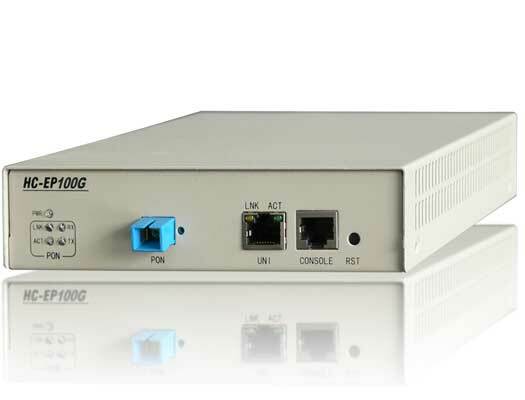 Huachentel provides full range of ONU series products, including HC-EPU100 (1×100M fast Ethernet to 1×PON port), HC-EPU100G (1×Giga Ethernet to 1× PON port), HC-EPU400 (4×100M fast Ethernet to 1×PON port), HC-EPU800 (8×100M fast Ethernet to 1×PON port), and HC-EPU2400 (24×100M fast Ethernet to 1×PON port). True “Triple Play” service access over IEEE802.3ah compliant PON, shared with up to 64 customers. Up to two auto-negotiating Fast Ethernet subscriber ports for 10/100 Mbps, half-duplex/fullduplex operation. SNMP based network monitoring and management via HCView software, including bandwidth provisioning and status monitoring. adapter available as a customer option. Compact, lightweight indoor unit with optional panel mounting box with fiber splice organizer or environmentally friendly outdoor enclosure with integrated splice organizer.